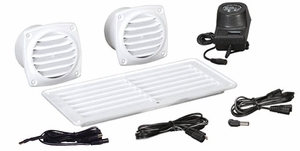 This vent system is designed for venting a recessed mounted plasma or LCD TV which is subject to major heat buildup. There are many factors and variations related to how the recessed openings are framed during construction but this product should accommodate most situations where a plasma TV is framed and recessed in a wall. This system is easily installed and extremely effective. It is however critical that the installer uses proper judgment prior to installing the product to limit damage or complications that may occur (hitting studs, etc. ).